I just got back from Tokyo, Japan where walk/stop signals on the streets are strictly adhered to. That fact sparked up the age-old conversation here in the US around adherence to these signals while raising kids. 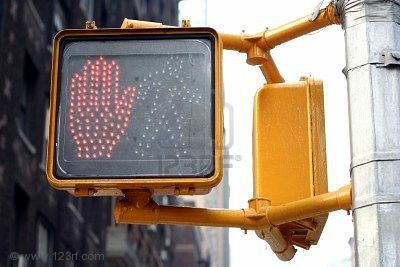 As parents, do we adhere to the letter of the law all the time, or as pedestrians do we cross the street with our kids when a pedestrian signal says "stop?" When my son was about four or five years old I "jay walked" with him for the first time. Prior to that we had been obeying the pedestrian signaling without question (nice and easy). It happened early one Sunday morning while walking around downtown. There weren't any cars around, and we were standing at a traffic light with the pedestrian signal indicating "Stop." I stepped into the street to cross with his hand in mine. He said "daddy, the hand is up!" I replied "yes it is," and we kept walking. A long conversation ensued in which I tried to explain my departure from previous behavior, how what mommy and daddy had been telling him to-date was no longer valid (you're getting older and streetwise now, so the childish, simple, rules we've been applying aren't as relevant anymore), what "the law" meant (the state works to protect us with generic rules that work most of the time), what discretion meant (as humans, we are autonomous sentient beings that make our own decisions based on certain circumstances), what idiocy meant (we were standing at a clear intersection in the off hours of the day without any cars in sight, staring at a mindless red hand strapped to a pole telling us to "stay put"), what independence meant (there are times we take matters into our own hands), what risk meant (by doing this, we were clearly breaking the law and we could be ticketed for doing so. also, if we're not careful, we could dull our awareness to the protection that the law provides, and walk into a busy street at some point in the future; putting ourselves and others in danger), what peripheral vision meant (if you see movement out of the corners of your eyes, identify it and evaluate it before walking into a street), and what responsibility meant (we'd have to humbly accept the consequences of breaking the law if we were caught). Needless to say it was a nearly impossible conversation to have with a child, that stemmed from a conceivably simple act of crossing the street. I felt it was crucial and necessary however. Life does not work by adhering to all of the rules all the time. There are times when we take risk to accomplish the things we want, and to be who we want to be. There are times when we know better than the system. I've since had the conversation and "crossing" moment with my daughter. We have thoughtful, aware, and generally (we cross the street when we're not supposed to sometimes) law abiding children. We DO NOT have blind rule followers that stop and go through life like zombies lacking an understanding of the world around them. We've been breaking this law with discretion for years now, and we'll continue to do so. We have, thankfully, been accident free (incident free for that matter). My kids are highly aware of their surroundings when out in the world; other people, cars, trucks, alleys, crosswalks, street lights, etc. I was just responding to an internal email thread at Gnip and the following came out. As I re-read it, I thought it might make a good blog post. Here it is. One of the most valuable things we have is our deliberate, conscious, and directed trajectory. The approach we take to closing a prospect, conveying a message (internally or externally), or prioritizing a feature, is deeply thought out, and has been tuned over time. Most importantly, it's working! For example. The board has been "on us" for years now to "go faster," "push harder," and to "take more risk." We listened to that feedback, rolled it into our overall operating plan and philosophy, and executed against *that,* as opposed to jerking our knees to the "go faster" message. The result? A phenomenal 2012. We continue to do this. I think something we do exceedingly well as a management team is orchestration. Are there times when it feels slow? Yes. Would I rather have those challenges than those in which we're managing reactive behavior? Yes. We begged borrowed and stole (metaphorically speaking on the "begged" and "stole" fronts), during the first half of Gnip's life, but, we haven't had to do that for awhile now. We have strong business underpinnings (from a customer/revenue standpoint, as well as management team). We have gotten to where we are via luck, and careful calculation (on the part of smart people who know how to calculate). There will always be moments when we need to grab the wheel and jerk it (e.g. if we realize we're approaching the edge of a cliff at the final second), but that is not how we lead, and that is not how we execute, on a day-to-day basis. As we all come to terms with the task at hand (the need to "go faster" and "capture more" and "think bigger" and "take more risk"), we cannot forget where we've come from. We can move faster and take more risk without radically changing our management approach and style. We will do it by consciously steering the ship at the right times, and in the right places. The key to the long-game here is consistency in approach and behavior (not to be confused with consistency of personell; the team is going to change this year). We win by, channeling our enthusiasm, passion, drive, and direction, into prioritizing the things we want to accomplish, and letting the process and system we've created execute. My company, Gnip (a social media company), blew the doors off of 2012. The business grew tremendously, we saw concrete manifestation of an ecosystem we've visualized since the beginning, and the product lit up business after business with the public social data they needed to bring value to their own customers. It was awesome! That's behind us now though; 2012 is gone. 2013 is here. What now? Can we crush it again? One thing I hear over and over is "well, the number is bigger now, so continued X% month-over-month growth is harder. Be careful with the expectations you set; be realistic." From a business and experience standpoint, I get that, but from an entrepreneurial standpoint, forget it! There's a lot of talk this time of year around how to think about targets and goals. Just like everyone else dedicated to building great things, I've been mulling, and discussing, this with a bunch of folks recently. Here's how I'm thinking about it after several weeks of trying to get my head around approaching "targets" and "goals." These are the three trajectories that Gnip can take in 2013. This is status quo. We have a business that's working. We can continue to work it and life will be good at the end of 2013. This is our safety backstop. 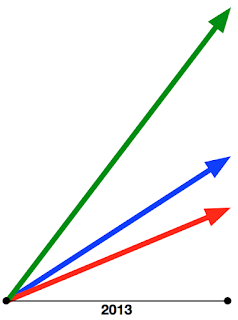 If we push hard, successfully build some new products, effectively sell them, push out of our comfort zone and expand in a variety of operational/execution areas, we will hit the Blue Line. This is what we wake from our cold-foxhole on the battlefield every morning for. This is why we are at Gnip. This is what we fight for everyday. This is why we do what we do. We want to hit some big target that simply wasn't feasible on day one. We want to hit something that feels very uncomfortable and scary in the moment of discussing it. We want to hit something that isn't tangible at the beginning of the year. Every company has these three lines (all with different starting points of course) and you can invoke their trajectories whenever you want. As I look out on 2013, Gnip has a set of things we can do to achieve each one of those lines. Our job is to execute on the set of things for the trajectory we consciously decide to pursue, each and every day of 2013. The questions you should ask yourself are what are the sets of things associated with each trajectory, and which trajectory do you want to execute on? We're a family of four and we own one car. We live/work/school all within walking distance of our house, in Boulder, CO; that's by design, not accident. I'm a huge advocate of car share/ride share, and public transportation, programs. Personal/daily use automobiles are one of the worst things humans have ever come up with. Sport/vanity cars are an exception in my mind b/c of relatively low volume/use. The way we use cars is truly pointless given all the other options that exist. Anyway... this isn't a political or environmental activism post. It's a post about how much I spent on car shares in 2012. 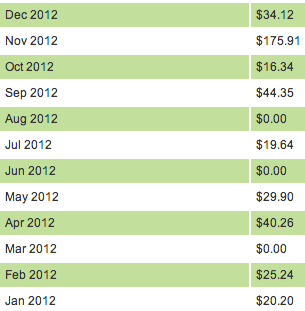 Looking back on 2012, here's what I paid for car share programs. I use eGo in my home town instead of buying/owning another car; you can see that it's a screaming deal vs owning a car. We don't pay for insurance or gas or garaging or maintenance for eGo. I will note that my office is a walk from my house. I would probably buy another car if my work commute couldn't easily be done on foot or bike or bus. I use ZipCar when I'm staying in SF and have meetings either down on the Peninsula or North of the City. Renting a car is a) more expensive b) airport inefficient (you have to deal w/ the rental car center location and process) and c) leaves you stuck dealing with a car for your trip. I generally do a ton of walking to/fro meetings. Dealing with cars in cities is obviously a major pain because parking is so hard. Find a spot... figure out how, when, where to pay for it... blech! I thought I used ZipCar more than I do. Walking and Uber undoubtedly prevent me from using ZipCar more. The amount I spend each year on Uber, cabs, and airport car service would certainly dwarf all of the above, but that's another post. My personal email inbox has these three messages in it. One is from a piece of hardware in my house (Twine) whining about dying. Another is from a piece of software in ether reminding me to mess with another piece of hardware in my house (my Nespresso machine). The final one is from my climate control system complaining that the air filter needs to be replaced. Awesome examples of engaging emails that will get me to act, and make my life better/easier. I'm sidestepping the "nag" factor for now. During Tuesday meditation at Dojo4 this morning something hit me in the context of "community." A few months ago my daughter had a section in her 2nd grade class wherein they discussed "community." What makes a community? What does a community need to be a community? etc. It was wild seeing it broken down like it was at a literal elementary level. Dojo4 has become a community anchor for me. What makes it so? It hasn't been around too long, but a few years at least. It's not some fly-by-night firm/team/place that comes and goes with the wind. I can count on it being there for me (for a drink, a chat, help with software, spiritual connection, philosophical debate, whatever). Its soul remains the same even though things like interior design may change. What they set out to build remains consistent. Their values stay largely the same, and that permeates the space and the people. Minimal flash, but true intent behind what *is* there. The door is always open at Dojo; for whatever. I tend to engage with the space for spiritual grounding (odd as that may sound to people :)), but I know there's much more there. Communities need anchors with the above qualities in order to be real. Nicely done Dojo crew! There's a bunch of "startup community" content forming these days. While I didn't want to focus on "startups" specifically in this post, Boulder, CO (where Dojo4 resides) is indeed a thriving startup community. Dojo4's an important part of it.